Children look on amazed in the community demonstration of drones flying in Lilongwe. 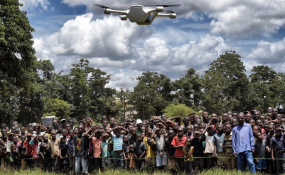 Lilongwe — The Government of Malawi and UNICEF today launched an air corridor to test potential humanitarian use of unmanned aerial vehicles (UAVs), also known as drones. The corridor is the first in Africa and one of the first globally with a focus on humanitarian and development use. "Malawi has over the years proved to be a leader in innovation and it is this openness to innovation that has led to the establishment of Africa's first drones testing corridor here in Malawi," said Malawi's Minister of Transport and Public Works, Jappie Mhango. "We have already used drones as part of our flood response and we can see the potential for further uses, such as transportation of medical supplies, which could transform lives in remote rural communities." 3. Transport - delivery of small low weight supplies such as emergency medical supplies, vaccines and samples for laboratory diagnosis, including for HIV testing. "This humanitarian drone testing corridor can significantly improve our efficiency and ability to deliver services to the world's most vulnerable children," said UNICEF Office of Global Innovation Principal Adviser Christopher Fabian. "The success of these trials will depend on working in new ways with the private sector, government and local entrepreneurs and engineers who can ensure that technologies deliver appropriate solutions for the people who need them the most." UNICEF has also deployed drones to support the Government of Malawi's response to recent floods. UAV flights went out in Salima, Lilongwe and Karonga between February and April 2017 to provide aerial footage to help assess the needs of affected families. The aim of the flights was to conduct faster, more efficient and cost-effective assessments of the situation of communities and families. UNICEF is also exploring the potential for drones to be used to support immediate search and rescue efforts. "Malawi has limited road access to rural areas even at the best of times, and after a flash flood earth roads can turn to rivers, completely cutting off affected communities," said UNICEF Malawi Representative Johannes Wedenig. "With UAVs we can easily fly over the affected area and see clearly what the impact has been on the ground. This is cheaper and better resolution than satellite images."